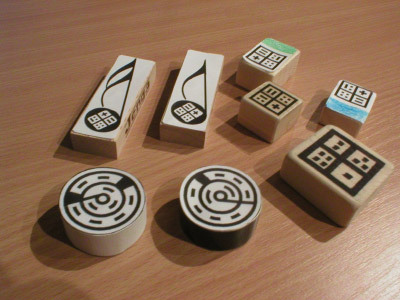 The d-touch project, in contrast, uses tags on the blocks that are recognized by a simple webcam (fiducial recognition). Advantage: no projector, no fancy interface, ultra-portable, ultra-cheap. Sure, you lose out on the tricky visuals (and, importantly, visual feedback) — but you get the even more mysterious effect of moving around ordinary blocks with strange hieroglyphics on them. d-touch features cross-platform C++ code (compiled on Mac OS X, but tested on Linux and Windows, too); the code is open source and regularly updated. Give us a buzz if you do something with it, because I can’t program my way out of a paper ba– uh, tangible interface.